Sat, Feb 9, 2019, 12:18 pm SL Time, ColomboPage News Desk, Sri Lanka. 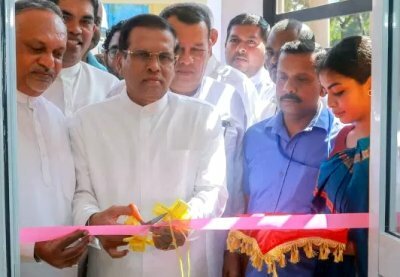 Feb 09, Colombo: Sri Lanka President Maithripala Sirisena says a systematic approach will be taken to win the challenges in building positive future for the youth. The President made these remarks at a function held to declare open the Sri Lanka Carrier Guidance Network Center in Polonnaruwa yesterday. Addressing the gathering, the President further said the newly constructed center will provide necessary guidelines for the youth to be trained in various professional skills. This center will also provide necessary advice to the youth to select the suitable profession as their career. The Sri Lanka Career Guidance Network is implemented under the Smart Sri Lanka project conducted by the President's office. Its objectives include enabling the young people to march forward in a career they choose, entrepreneurial opportunities, job banks and networked professional facts collecting service, enabling to meet the career guidance advisors privately, uplifting the career guidance services in to international standards, building a network of career guidance institutes island wide. Sri Lanka career guidance unit will provide the pathway for the youth to understand where they must prosper in their career and choose a profession that suits their eligibility and to stop seeking the support of politicians to get a job, according to the President's media division. President Sirisena further mentioned that, the major barrier behind developing this country is the change in attitude and the inability to take risks, and that the today's youth is not ready for that. This new line of projects will be of greater value in leading the youth by providing career guidance. Such career guidance units will be opened in every district within the next three months.